How Do You Magically Turn $20 Into $24? The Vinnies Vault Card is the perfect gift, stocking filler or simply a treat for yourself, available exclusively for use in Vinnies Shops in Western Australia. By purchasing a Vinnies Vault Card for someone special, you’ll get a buzz knowing your gift will help change lives with the proceeds going towards Vinnies WA specialist support services. 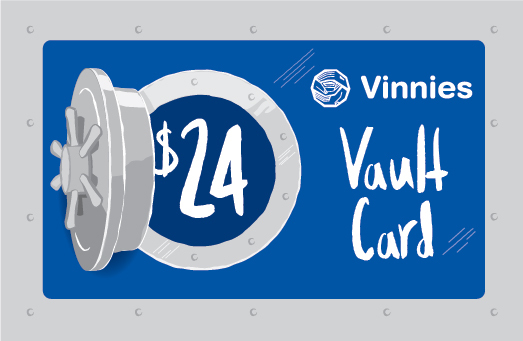 Next time you’re at Vinnies, pick up a Vault Card for $20, wait 24 hours to activate your bonus $4 and then drop back in for a visit to spend $24! Only available for purchase and use at Vinnies Shops in Western Australia from 26 November 2018. All cards are valid for 12 months once purchased.